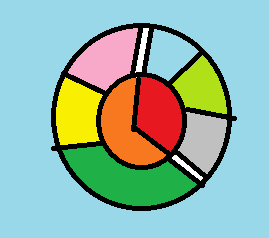 it is possible to draw two PieCharts in one circle , one inside and one outside? The preferred approach would be to specify nested data and use navigation.initialDrilldown to specify the initial view. This would allow the user to navigate the chart etc. However, if you want two completely separate piecharts you can do that by creating two charts and for the second specifying parentChart instead of container. outside pie is derived from the inside pie in his area? The intention is that the user would "drill-down" into one of the parent slices and then the whole circle shows the child slices. Although it is possible to simulate the layout like what you described (the main thing is to set interaction.others.enabled=false so that the smaller slices are not aggregated) currently it is not possible to get those white separator lines.